Before break, The YU Eco Reps hosted a fun event to raise awareness of Earth Week to the greater student population. To kick of a series of exciting and informative Earth Week themed events was a showing of the Oscar winning film, Wall-E. This Pixar production challenges the larger issues of consumerism, environmental degradation and waste-management while cleverly illustrating the immense impact humans have on continuing our world’s sustainability. This loveable and intelligent film raised several important questions as several students watched the film on the Wilf campus. Between bites of pizza, students saw the brave robot clumsily fight to save the last remaining plant on earth. 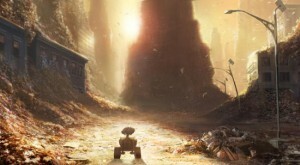 Due to human’s wanton disregard for the environment and inaction to stop pollution, Wall-E’s earth became uninhabitable. Hopefully by raising public awareness of pro-environment causes, young people – like the ones at Yeshiva University – will encourage sustainability and positively act towards preventing future environmental collapse.